Guest Post: I Do UX – Do You? The IWMW 2014 event starts a month today – this year the annual event for university Web managers will take place at Northumbria University on 16-18 July. In the latest guest post from speakers at the event Neil Allison tells us that he ‘does’ user experience (UX) but wonders if he is alone. 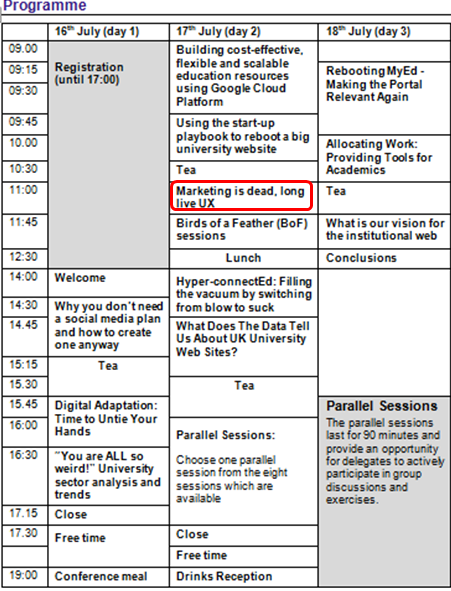 Neil is giving a plenary talk on “Marketing is dead, long live UX” from 11.00-11.45 on Thursday 17 July 2014. He will also facilitate with Bruce Darby a workshop session on “Making Personas Work” from 16.00-17.30 on Thursday 17 July 2014. I Do UX – Do You? Neil Allison will give a talk on user experience on the second day at IWMW 2014. I love the IWMW conferences. Always come away with new ideas and food for thought. Always meet good people. But I’ve been thinking about what I don’t get from the IWMW. And it’s this thought that’s prompted me to speak at this year’s conference. I’ve been working in public sector (and mainly UK HE) for 15 years and attending IWMW since 2006. In that time there has been a lot of change in terms of online content and service management in the sector. And over this period there has been a huge growth generally in awareness of online usability and latterly the competitive advantage leveraged from improved user experience. But while user experience teams are cropping up in all sorts of commercial organisations, we’re not seeing it in higher education. This brings me back to what I don’t get out of IWMW. I don’t get a sense of a UX community within the sector. I don’t tend to meet people who do the same kind of things as me. I do meet lots of people interested in usability and user experience but not much in the way of active practitioners. Very little turns up on previous conference schedules around UX or usability. The last item was me in Edinburgh in 2012 doing a workshop on our experiences in user centred design. And the JISC usability mailing list is awfully quiet. Chatting with Dan this week, it seems like he wasn’t overwhelmed with responses to his question. Which is a shame because it’s a very important question. It’s basically the question I’m asking and attempting to answer in my plenary talk. I have my opinions, and those of a few people like Dan who think aloud from time to time. But what about you? What do you think? I’ve set up a short survey to gather some experiences from around our sector and feed them into my talk (and probably a blog post too). Please spare me a couple of minutes to contribute your views and perhaps outline what is happening at your institution. Take part in my survey – the state of UX in UK higher education. 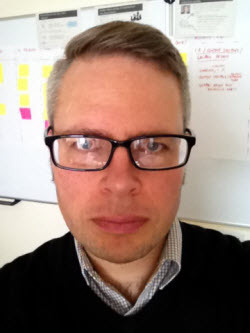 Neil Allison is Head of User Experience for the University Website Programme at the University of Edinburgh. He believes everyone has responsibility for user experience, and with a background in education and training, works to give colleagues the skills and confidence to conduct their own research and inform their work. He is an active member of the Scottish chapter of the UX Professionals Association. Neil is currently playing the role of product owner in the agile development of a new University CMS and leading the evolution of the website’s information architecture.